As the Hot Pocket empire expands into croissant, pannini, calzone, sub and (cringe) breakfast products, Tony has thrown his big red puffy hat into the ring and made his own version called Pouches. Just going by the name, I woud prefer Hot Pockets over Tony’s Pouches but I put the names aside and Ethan helped me out with the evaluation. Both items feature cheese and meatball inside. After cooking in its special crisp-inducing microwave sleeve, we noticed there was in fact, a small amount of crisp on top from the sprinkled cheese. We agreed the dough was nice and soft, yet not undercooked. Inside was a good combination of sauce, cheese and meatball. The sauce was pretty flavorful, even “zesty” (but not too zesty like they just dumped a bag of oregano in it) and the cheese tastes like, as the box says, real cheese. We were impressed with Hot Pockets. The only thing that might be misleading is that the meatball tasted more like Italian sausage, but it’s good for those who like a spicy meatball! Tony’s didn’t have any special cooking sleeve, just take it out of the plastic casing and pop it in the microwave. We noticed the dough was thicker and gummy in some places and too chewy or dense in others. The sauce was bland and we couldn’t really taste the cheese. We cut these in half and I think Ethan got all of the meatball because I didn’t remember tasting any. Only when Ethan said there wasn’t as much meatball as Hot Pockets, I realized how unnoticeable it was in my half. So the meatball presence was either absent or they put it on one side. 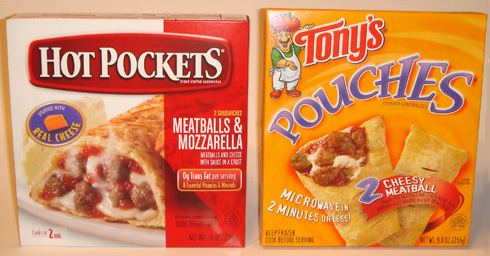 Tony’s was a disappointment, it was everything I usually think of when I think of Hot Pockets (not that I sit around thinking about Hot Pockets) with it’s uneven dough texture, bland ingredients and lack of balance inside. 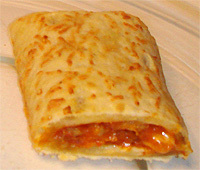 I guess Hot Pockets really knows what they’re doing. While I probably won’t find myself buying these again, we found the pocket to be surprisingly tasty and they really seem to put some thought into the ingredients and they way it’s prepared. Although from a quick google search, I see Tony’s Pouches has at least huge one fan in the World of Warcraft forums named Dansei. Dansei, thou can have ye other pouch dwelling in my freezer because I’m never going to eat it (leave spiked club at the door). What say you, Hot Pockets or Tony's Pouches? important to note is how much cheaper Tony’s Pouches are. Thats why they find their way into my freezer. These both are definitely pseudo foods. They remind me of the old Wendy’s commercial – “Where’s the Beef?” You need a search party to find the beef or any other meat in these. Hands down I like Tony’s Pouches better. But for the last few months I have not been able to find them in my town. Only the Wal-Mart grocery even had them, the other chain grocery did not, but now you can’t even find them there. I didn’t buy them a lot, but they were great to have for a quick meal when there wasn’t time to cook. Now Hot Pockets are residing in that space in my freezer. Well, it’s not like you really feel good after eating a Hot Pocket anyhow. I prefer them over the alternative, mind you, unless there’s a REALLY cheap off-brand available. Personally I prefer Tony’s Pouches because in my opinion they just taste better. Sure they don’t have as many flavors as Hot Pokets but hell I’ll take Tony’s anyday. I’m intensely curious as to what results a review of McCain’s Pizza Pockets vs Pillsbury Pizza Pops might yield. My friend eats the Pizza Pops every day for lunch, and I actually like them a fair bit as well. 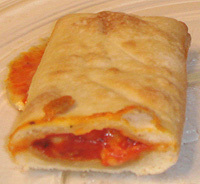 I’ve had the Pizza Pockets before and they seem like pretty much the same thing. But as I said – curious as to what you might find in a possible review. That sounds like a good showdown! I haven’t seen either products but I will keep an eye out for them. Let’s just say that I’d eat anything that’s supposed to be like pizza unless it’s made by Tony’s.